Below is a list of APEC's customer reviews and comments that we have collected off the internet, all gathered from independent websites. For our regular testimonials which were submitted to us directly by our customers, click here. GREAT COMPANY! This company stands out from the rest as a well-organized, professional business, that goes over the top in customer support. They competitively provide a superior RO water system with superb documentation. They even go so far as to color code all the tubing to the filters and supply sources. If you have a question now or years later, they promptly provide the comprehensive answer. In fact, they go to extremes to not over-sell the product replacement filters. Each kit comes with a water tester to help you determine when it's time to change components. GREAT COMPANY!! One of the best discoveries I ever made was finding APEC. While other websites make vague claims about their products, APEC got into the kind of exact detail that can only be provided by people who know what they're doing and what their product is all about. So we bought an APEC RO-PERM system a few weeks ago. It is by far the best reverse osmosis system we've ever seen. It arrived in perfect condition, shipped promptly the next day after I ordered it, came with superb installation instructions and hardware. Also very well packed. The system and the materials look high quality just as APEC described on their website (FreeDrinkingWater.com). We could not be happier. My wife and I have been enjoying the great taste of the water. With the free included water quality meter, our original tap measured about 380 ppm (parts per million) of total dissolved solids. After passing through the RO, the water measured 4 ppm- amazing! The water quality is even better than the bottled water that I have been paying high prices for. Tastes better than bottled water too. The difference can also be seen in our ice cubes. Before the APEC RO, I wouldn't touch the almost solid white ice. After the APEC RO, I am stressing the capacity of the icemaker. The cubes now are almost clear. What a relief, now my water buying and lugging problems are gone!! Goodbye bottled water. Hello savings and convenience. 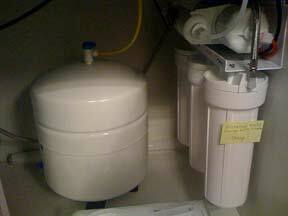 I have been wanting to get a good quality reverse osmosis system at home. After doing some research, I found a good system at APEC. I looked at the systems at Home Depot, Lowes, and Costco. Most of them have their own unique filter cartridges so you have to buy the replacements from them. They ranged from about $150-$200. Most of them were only 4 stages. The APEC has standard filter holders. Comes with an extra set of the first 3 pre-filters Made with top of the line NSF parts It doesn't flush the RO membrane like some system but uses 4:1 ratio for waste water The hardest part of the installation was drilling a hole in my porcelain sink for the facet. I got it installed and am very happy with the quality of the system. Spring water is good... reverse osmosis water (RO) is good too (Disanti, etc). 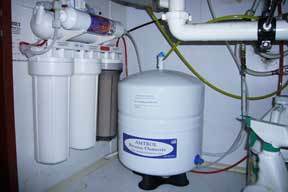 You can get a reverse osmosis system for your house from www.freedrinkingwater.com (I would recommend that site... honest dealings with many folks I know) and I have no association with them other than being a regular customer. I would recommend the 9 gallon per day one at least and you can add a UV sterilizer to kill living organisms that might be lurking in your water. Because I have extremely hard tap water(330ppm out of a Whirlpool 2 Stage filter) I have read several post on this site concerning water quality, and from what I gathered was that you don’t need a Reverse Osmosis water filter system for hydroponics. So I thought to myself why do I continue to have water issues: pH fluctuations, nutrient lockouts, and overall poor results with my Cherokee Purple tomatoes from Harris Seeds company. So I went out and bought some distilled water and to my surprise my plants bounced back, after running the distilled water for a week. I decided to confirm my crappy waters poor quality by putting my Whirlpool two-stage filtered tap water back into my system and the plants reacted almost immediately for the worst. This convinced me that the water was the problem and a two-stage filter system from Lowes just wasn’t enough filtration. 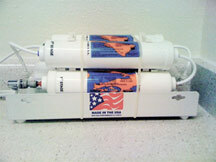 After hours of internet research I found two water filter systems that I considered both made in the United States, the first a Watts Premier 5 Stage water filter system (www.wattspremier.com) which requires the filters to be changed every six months and the membrane every year. The second system I found was an Apec RO-45 5 Stage system (www.freedrinkingwater.com), the filters on this system are changed annually and the membrane is changed every two years. Both were reasonably priced but the Apec system is more cost effective to maintain, so I went with the Apec filter and paid about $327 with shipping and handling. I have to say that this is the best investment I have made so far in regards to my indoor gardening hobby. No more pH adjustments, I don’t have nutrient lockouts anymore, and my plants looks 100% better not to mention that my family and I now have CLEAN drinking water for consumption and cooking. I also have a two 30-gallon fish tanks that no longer need the calcium build up scrapped off the side of the tanks weekly. I hope this helps those whom question their tap waters quality and ability to sustain your hydro systems. Google the RO45 by Apec. Its what I use and many others I know. A great 5 stage unit for the money. You will see the difference. Flowering plants that used to stand straight and tall will suddenly be bending over like drunken sailors from the weight of the buds. Yep, the guys came in yesterday and installed my 5 stage Reverse Osmosis water filter. Couldn't be happier about achieving one more goal towards eliminating BPA-leaching and environmentally unfriendly plastic water bottles from my life. After TONS of research I decided on this unit by California based APEC Water Systems. It was pretty easy for the plumber to install. I'm sure that anyone who is even remotely handy could install this unit (detailed installation instructions were enclosed) in no more than a couple of hours. Hi, I hear y'all are looking for water filters. If you haven't purchased one yet read on. A year and a half ago when I was having serious digestive trouble, I did mucho research into water filtration systems. The best (and the best bang for the buck) bar none were the RO systems from APEC. It's hard to separate the wheat from the chaff in water filtration systems because the vast majority of what you find is being resold and often rebranded. APEC is not a reseller. They are the designers and manufacturers of the systems they sell. APEC only uses standardized FDA/NSF certified components that you can buy elsewhere if you so choose. My experience with APEC and their products has been nothing less than stellar. I would recommend you install an under the counter model with a spigot next to the faucets in your kitchen (this is what I did). I got a 9 gallon per day model for my family of 5 (which as it turns out is a little small... we run out of Reverse Osmosis (RO) water during peak demands. I bought from www.freedrinkingwater.com which is a reliable and good company (no affiliation). I also got the Ultra-Violet (UV) sterilizer feature that kills spores, cysts, virii, etc. The water provide water to my refrigerator for ice and the front door has a cold water dispenser too. We have an APEC system from freedrinkingwater.com. It's a great unit. We have had it close to a year. No problems with it at all. We did buy the extra large tank for it, that makes it more convenient. From APEC, where I bought my RO filter system, here is a picture of my industry standard, 5 stage reverse osmosis system, that gives me gallons of CHEAP pure water, that tastes excellent, every day. I bought one like you pictured from freedrinkingwater.com about 5 years ago and it's worked great. I put new filters in every year about this time, and never think about it again. It costs about 300, makes a gallon an hour with a 4gal res. With a little thinking ahead, I can have 3 five gallon buckets filled with fresh water, for the weekly change, in 1 day. The filters cost about 45 annually. And the ice tea is great. Also, hook it to your icemaker for truly marvelous ice! 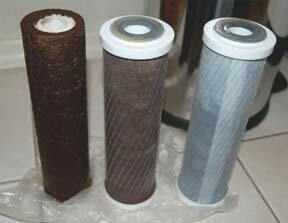 Why your Brita or other single-element water filter probably doesn't work so well: These are the first 3 filters (pre-filters) from a 5 element Reverse Osmosis system. They were WHITE when new. This is what they look like after 6 months. The first is a 5 micron sediment filter. The second and 3rd are carbon block filters (also 5 micron). Notice how nothing visible got by the second one. After this, the water goes through a .0001 micron reverse osmosis membrane and then a final carbon filter. so you see - if you have a crappy single stage filter, you're drinking all that gunk stuck to the center filter. We just bought and installed this one ($340 on sale right now): https://www.freedrinkingwater.com/ro-90-detail.htm There is a lot of water "wasted" to carry out the things that are removed (all RO works this way) so we are trying to figure out logistics to drain the water water to the flower beds. Water tastes great...easy to install water. Tested from tap has about 280ppm solids and water from our RO has about 20ppm...the RO water we've bought at Whole Foods for the last 5 years has 8ppm, BTW they have one that is a little slower for about $40 less, too. Well, we did it. We fired Arrowhead Spring Water and we researched, purchased and installed our new Reverse Osmosis (RO) Water Filtration System. We went with a high flow 5-stage system by APEC Water Systems. It came with a digital TDS (Total Dissolved Solids) meter for testing water quality. Converting to filtered tap water is definitely the safest, most economical and earth-friendly solution for drinking clean, safe water. The investment up front ran us $411.19. That amount is close to what we paid yearly to have water delivered to our home! Now, we have one less bill, less clutter in the kitchen and SAFER water to drink. I bought a system off a company called www.freedrinkingwater.com in California for about €400 delivered to Ireland a few months ago, dead easy to install yourself in about an hour. It runs away fine and my TDS meter reads about 15ppm I think. Hi Mark, It sounds like you have a very nice water supply. You are fortunate that it is free from contamination - these kinds of sources are becoming harder and harder to find. Especially the above ground water. As far as the whole house filtration system I would recommend something like this: https://www.freedrinkingwater.com/whole-house-water-filters.htm For your installation I think the HBB-20 would be plenty big enough. You will note that the filter, FI-SED20-BB, is washable and reusable. If you want really pure water get a reverse osmosis water filter. I bought one through: freedrinkingwater.com. Diverting the waste water is very, very simple. Mine does indeed end up on my garden and the taste of the filtered is such a delight I find myself enjoying a glass of H20 where I used to have something out of a package. I installed a RO filter at our home as it removes Flouride as well as cloride componds and agents that keep pipes from rusting! After researching the internet, I settled on www.freedrinkingwater.com, I've been very happy with our unit. And, I've had samples tested to confirm purity. It's a 5 stage unit, it was ~$300.